Business premises on the High Street, vacant as of October 2017. Still vacant as of June 2018 and February 2019. 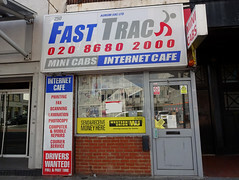 It was previously a minicab firm and internet cafe called Fast Track photo, but this closed down some time between September 2016 and October 2017. It was previously a cab firm called Elite Mini Cabs, but by February 2015 this had been replaced by a minicab firm and internet cafe called Fast Track photo; this in turn closed down some time between September 2016 and October 2017.
photo of Elite Mini Cabs business card from December 2012. Last edited 2019-02-07 16:20:05 (version 29; diff). List all versions. Page last edited 2019-02-07 16:20:05 (version 29).